Wake up your shower and refresh your senses as you lather up with Akaliko Mild and Balancing Shower Gel. 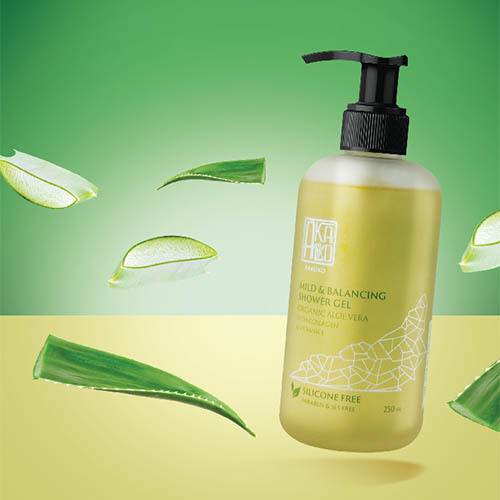 It combines mild cleansing agents with organic aloe vera, collagen, fruit extracts, and vitamin E. This SLS free product creates consistent foam without causing irritations, gently cleansing skin without dehydrating it while offering a luxurious sensation of well-being. • Apply to wet skin in shower or bath, work into rich lather, clean yourself and rinse thoroughly. • Suitable for all skin types and do not dehydrate the skin after showers. • Simply lather between your hands, apply to a cloth or sponge or pour under hot running water for an indulgent foaming bath. • Aloe Vera Extract protects skin from irritations and leave skin supple. • Collagen extract and fruit extracts help to nourish skin, support skin health and reduce fine lines and wrinkles.